This drawing had all the ingredients to be great. A beautiful subject matter courtesy of my friend Annette. Stunning colours. Heaps of nostalgia. And hours of time to simmer. Somehow, for me, it falls short of being an extremely tasty dish. 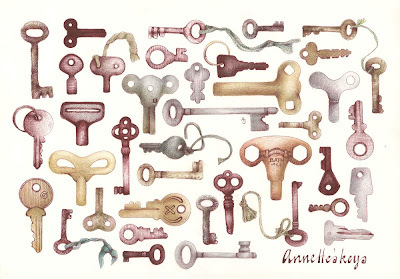 Everyday Matters #37, draw some keys. Perhaps the negative space doesn't have the AJ madness I've come to admire. Nonetheless, a great meat and potatoes drawing. The Budapest gulyas with just the right amount of paprika is just around the corner. Or does the title give me the clue that you meant it that way? oh, I love keys! I think you did a great job! don't be too hard on yourself :) you are truly one of my favorite artists!! thank you for your lovely comments on my blog, it's pleasure having you there! I think the cooking time was well spent! This is beautiful or simply delish....which ever you prefer..I love it!! Is it just me or is there a lot of fallopian tube going on in that drawing? Maybe it's trying to tell you something. Both an amazing collection and composition. My favorite moment is in the upper right hand corner. I love the ribbon linking the two keys. Emma, I bought 'tomberries' in Sainsburys the other day. Teeny weeny tomatoes. Half tomato half berry. Very cute.